Quoted in the "Sefer ha-Miẓwot." From the School of R. Akiba. A peculiar midrash to Numbers, of especial interest for the study of the Halakah. Its authenticity is wrongly questioned by Weiss ("Zur Gesch. der Jüdischen Tradition," ii. 238). Medieval authors mention it under the titles "Sifre shel Panim Aḥerim" and "Wi-Yeshalleḥu Ẓuta"; and to distinguish from it the well-known Sifre, "Or Zarua'" (ii. 22) calls the latter "Sifre Rabbati." The Sifre Zuṭa has not been preserved; and, as appears from a remark of Abraham Bakrat, it was no longer extant at the time in which he wrote his supercommentary on Rashi (comp. Brüll, "Der Kleine Sifre," in "Grätz Jubelschrift," p. 184). Earlier authors, however, knew and occasionally quoted it, as, e.g., R. Samson of Sens in his commentary on the mishnaic orders Zera'im and Ṭohorot. Numerous fragments are found in Yalḳuṭ Shim'oni to Numbers, which Brüll (l.c.) has collated (corrections and additions by Hoffmann, "Zur Einleitung in die Halachischen Midraschim," p. 60). Quotations are found also in Num. R. to Naso, as Epstein ("Mi-Ḳadmoniyyot ha-Yehudim," p. 71) has pointed out. The "Mekilta to Numbers" frequently quoted by Maimonides in his "Sefer ha-Miẓwot" is nothing else than the Sifre Zuṭa; for all his quotations may be identified among the fragments of the Sifre contained in the Yalḳuṭ Shim'oni, with the exception of a passage in Shoresh 11 referring to a Biblical section, for which, as Hoffmann shows (l.c. p. 59) by a comparison with the "'Aruk," Yalḳuṭ Shim'oni has not quoted the Sifre. Maimonides frequently drew upon the Sifre Zuṭa in his "Yad ha-Ḥazaḳah" also; and other medieval authors who occasionally quoted it are mentioned by Brüll (l.c. pp. 180 et seq.). The Midrash ha-Gadol to Numbers quotes the larger part of the Sifre Zuṭa, and has recently become a source of information concerning the latter. Königsberger has begun to edit the Sifre Zuṭa on the basis of the extracts in the Midrash ha-Gadol and Yalḳuṭ Shim'oni, though he has not as yet proceeded further than the first sections. A small fragment of the Sifre has been published by Schechter in "J. Q. R." vi. 656-663. The Sifre Zuṭa belongs to R. Akiba's school, as is indicated by the method of exposition; e.g., that of the double expressions in Num. xxxv. 21; of the partitive , ib. xv. 19; and of the ו, ib. v. 2; the phrase is explained as in Sifra, Ẓaw, ii. 1, and the term as in Sifra, Emor, vii. 8 (i.e. = ). There are also other points of similarity with the Sifra (Hoffmann, l.c. p. 69); e.g., the terminology in part, as ; although there are some unusual expressions, as (= ), (= ), (= ). Furthermore, some of the views expressed in the Sifre Zuṭa correspond with views known to be R. Akiba's, as in v. 14, with which comp. Soṭah 3a; and in v. 15, with which comp. Sifre, Num. 8. The midrash may be assigned to R. Simeon rather than to R. Judah, as is done in the case of the Sifra, although perhaps some of the anonymous halakot, as v. 15 (comp. Ned. 35b) and xv. 4 (comp. Men. 104b), express the views of the latter. R. Simeon's authorship is indicated by the fact that he is mentioned least often in the midrash, and that of the later tannaim R. Eleazar b. Simeon is mentioned a few times. There are still other indications pointing to Simeon's authorship, as, for example, the enumeration of the positive and negative commandments, which is said to be a characteristic of the Sifre to Deuteronomy, this midrash also being ascribed to Simeon. Further evidence is presented by the correspondence of various halakot with R. Simeon's views. Aside from the passages quoted by Hoffmann (l.c. p. 65), some of which represent Simeon's views more exactly than others—the parallel between v. 7 and Mek., Mishpaṭim, 15 is doubtful, on account of the different readings in the Mekilta—still others must be taken into account; e.g., Sifre Zuṭa v. 21 compared with Tosef., Sheb. iii. 7; vi. 20, with Nazir 46a (comp. Königsberger, "Der Kleine Sifre," p. 14b, note 63, and p. 24, note 128); and, what is especially characteristic, the reason for the law under consideration ( ) is inquired into, as in v. 15 and xix. 16 (comp. Tosef., Sheb. i. 7; Yer. Nazir 56b). The well-known reference of the Talmud, (Sanh. 86a), may therefore apply to Sifre Zuṭa, in which, furthermore, there are several exegetical notes on passages of Numbers mentioned in the Talmud, but which are not found in the larger Sifre (comp. Hoffmann, l.c. pp. 56 et seq.). 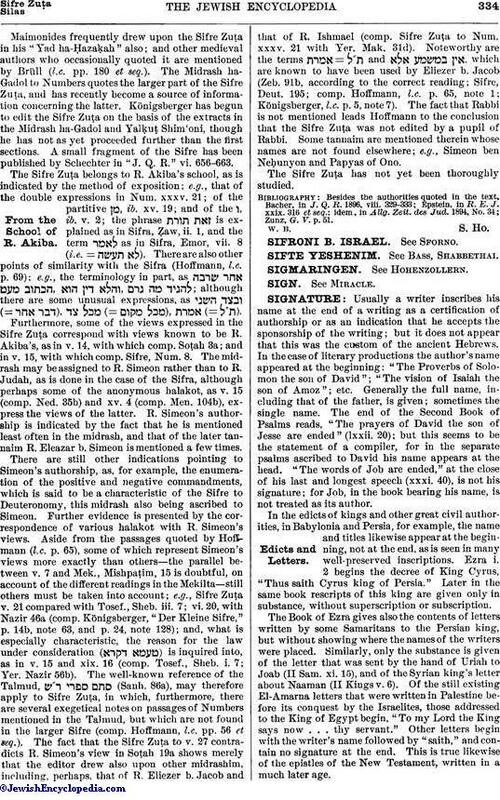 The fact that the Sifre Zuṭa to v. 27 contradicts R. Simeon's view in Soṭah 19a shows merely that the editor drew also upon other midrashim, including, perhaps, that of R. Eliezer b. Jacob and that of R. Ishmael (comp. Sifre Zuṭa to Num. xxxv. 21 with Yer. Mak. 31d). Noteworthy are the terms and , which are known to have been used by Eliezer b. Jacob (Zeb. 91b, according to the correct reading; Sifre, Deut. 195; comp. Hoffmann, l.c. p. 65, note 1; Königsberger, l.c. p. 5, note 7). 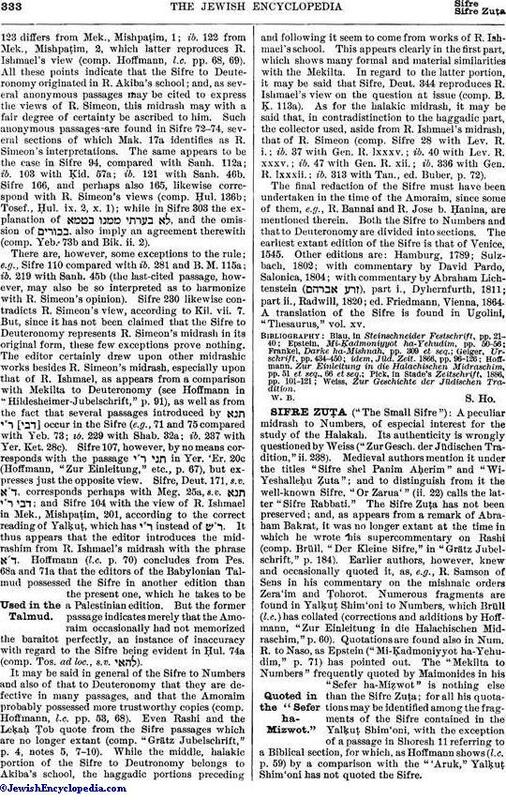 The fact that Rabbi is not mentioned leads Hoffmann to the conclusion that the Sifre Zuṭa was not edited by a pupil of Rabbi. Some tannaim are mentioned therein whose names are not found elsewhere; e.g., Simeon ben Neḥunyon and Papyas of Ono. The Sifre Zuṭa has not yet been thoroughly studied. Zunz, G. V. p. 51.